My Mother Has 4 Noses. Duke on 42nd Street (see Off Broadway). By Jonatha Brooke. Directed by Jeremy B. Cohen. With Brooke. Running time: 1hr 40mins. One intermission. 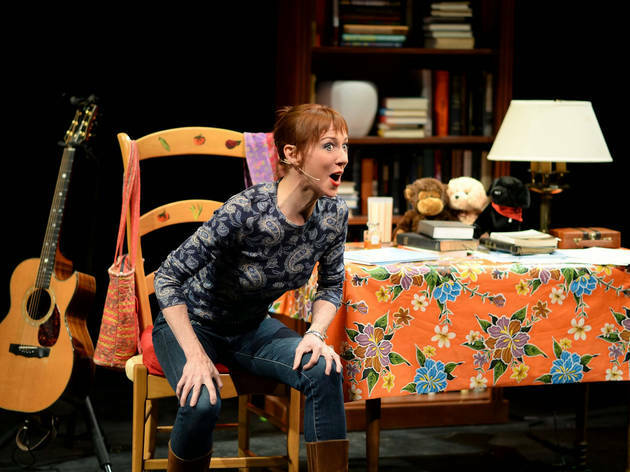 Singer-songwriter Jonatha Brooke stars in a solo musical of her own devising, based on her experience caring for a mother with dementia. Jeremy B. Cohen directs. 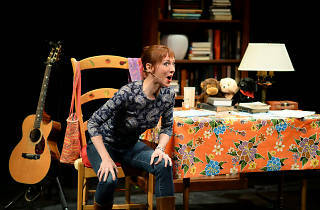 To anyone who’s seen the Carole King biomusical Beautiful down the block, Jonatha Brooke’s solo show starts with a familiar image: a singer-songwriter baring her soul at a piano. But unlike that slick piece of nostalgia, My Mother Has 4 Noses is raw, messy and current, as the playwright-performer gives an unflinching account of her late mother’s decline into dementia. Brooke—a Lilith Fair–style performer with a devoted following who never quite made it to the big time—is likable and articulate, and she conjures her hoot of a mom in broad strokes. The woman was a published poet, a sometime clown and a devout Christian Scientist who spent two decades trying to pray her skin cancer away until she finally broke down and sought medical intervention. Although the doctors saved her life, they couldn’t salvage all of her face—hence the title, which refers to her series of shockingly realistic prosthetic noses. And that’s just the backstory that brings Brooke to the last two years of her mother’s life as she cared for a vital woman who was slipping away with lots of bangs and whimpers, and constant pleas for her daughter to “get it all down.” It’s not all a bummer, though. Originally inspired by a blog Brooke kept and then a song cycle she wrote, My Mother Has 4 Noses has an engagingly episodic narrative. There are many painfully amusing moments, like her mom’s stint in a Christian Science assisted-living facility and constant poop problems. Brooke isn’t really an actor—and that turns out to be a good thing. Under Jeremy B. Cohen’s straightforward direction, she delivers the text without artifice, and when words and old photos (projected on a screen) aren’t enough, she turns to her emotionally evocative songs, gorgeously arranged for guitar, cello, piano and, in one case, kalimba.